Manager Brian Whelahan was powerless to prevent a big defeat. Brian Whelahan couldn't prevent a shock defeat for Offaly. FOR THE MAN regarded as Offaly’s greatest player, yesterday’s Leinster championship defeat to Laois marked one of the lowest points of his hurling life. Brian Whelahan attempted to put some sense on Offaly’s first championship loss to their neighbours since 1972, and laid the blame firmly at the door of his players. The Faithful County slumped to an eight-point defeat at O’Moore Park and Whelahan is now faced with the unenviable task of lifting them for the qualifiers. “No fight really, you know? 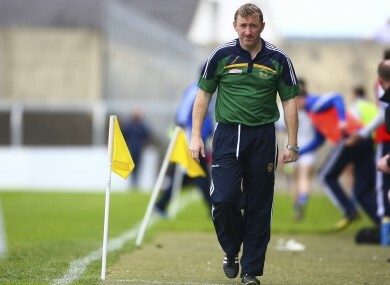 No fight when Laois came at us there late in the second half,” he told reporters. Whelahan revealed how he spoke to his players at half-time after Laois had come with a run of eight unanswered points to lead by four, but that key messages were not absorbed. “When we went short with puckouts, we were actually getting scores but when we went long, we were losing ball, drawing Laois on. “In the first 20 minutes we looked to be comfortable enough but we stepped off and fought for no breaking ball. “When we had numbers there, a Laois man seemed to come away with the ball. And Whelahan admitted that he doesn’t know where Offaly go from here in the aftermath of such a damaging setback. “I don’t know, to be honest with you. I don’t know where we’re going after today. “The mood in the dressing room is devastating. “I felt we couldn’t have prepared any better, the players seemed really up for it but on the day, Laois wanted it that bit more and that’s the most disappointing thing. “We were outfought and that’s very disappointing. “We felt we hadn’t a bad season, injuries were back right and we prepared well but fell flat and that’s a sickener, hard to explain. Email “'We were outfought, we fell flat and that's a sickener' - Offaly hero on crushing loss”. Feedback on “'We were outfought, we fell flat and that's a sickener' - Offaly hero on crushing loss”.